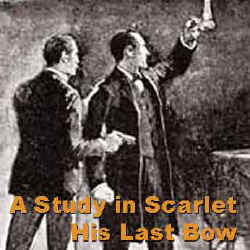 Audiobook - His Last Bow, a Sherlock Holmes story by Sir Arthur Conan Doyle performed by Patrick Horgan. Format mp3 files by chapter ~ 342 MB zip file. This collection of stories appeared in 1917 and features a propaganda yarn about Holmes' anti-German activities in 1914; this has the distinction of being written in the third person since Watson was not on the scene for most of the action. There are two interesting anomalies: Wisteria Lodge is dated in 1892 when Holmes was supposed to be dead; and the Cardboard Box story is distinguished by a lengthy passage lifted word for word from "Resident Patient". Doyle admits to being capable of plagiarism perhaps to acknowledge his more heinous crime of hoaxing the grieving public over Holmes' "death". Sherlock's brother Mycroft makes a rare appearance in connection with the Bruce-Partington Plans.